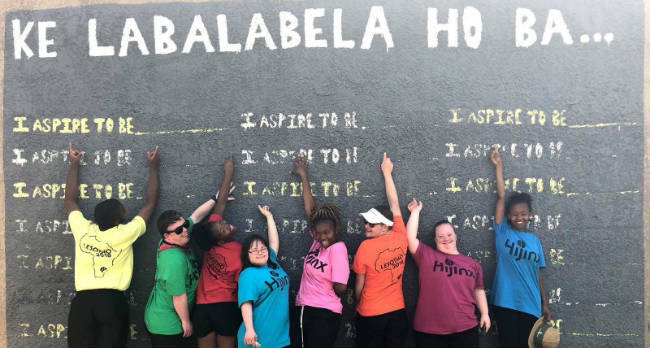 To mark World Down Syndrome Awareness Day, we caught up with the HiJinx inclusive theater group to hear about the stigma-busting legacy of their recent tour of Lesotho in Southern Africa. The international awareness day held on the 22nd of March highlights how negative attitudes and a lack of knowledge can prevent people with Down's Syndrome from having opportunities to make contributions. Ignorance exists around the world. HiJinx traveled to Lesotho to learn about performance culture in the land-locked country and to showcase the talents of actors who happen to have Down's Syndrome. Learning Disability Today: What was different about performing in Lesotho compared to performing in Wales? Jon Daffyd Kid: Theater doesn’t really exist over there. The theater culture is predominantly pantomime. We were keen not to come over as ‘white knights’. It had to be a cultural share, to ensure there was a legacy for both partners. The strengths of the actors we took are in their physical performance and expression so we involved physical prompts to spark reactions, similar to what is done in pantomime. There was gumboot dancing in the show, which sparked the audience to join in, either with local chants or by dancing. Learning Disability Today: Down Syndrome will get more attention on World Down Syndrome Day. What would you like people to know/ change? Learning Disability Today: Did you encounter any myths about learning disability or disability generally while you were out in Lesotho? Jon Daffyd Kid: We went out there two years ago. We went because in Lesotho, if you have a disability you are cursed and people cross the road to avoid people with learning disabilities. Children are often left by the road and rounded up by the police. There is one children’s centre there that has done great work to dispel the myths: Phelisanong Children’s Centre. The Centre grow their own herbs and sell them to the local community. It means people are now interacting with people with learning disabilities, but the Centre are detached - they are in the mountains. There are over 500 people with learning disabilities in the mountains, either working or being raised at the Children's Centre, or living or working in an orphanage. Learning Disability Today: What was the play about and can people see it in the UK soon? Jon Daffyd Kid: When we first came to Lesotho we went past a building with a chalk drawing and the words "I aspire to be". Only two children had filled it in – and they’d only filled in the careers "doctor" and "accountant". Why only two people? And why just those aspirations? That's what inspired the story of the play. There aren't any plans to tour the play in the UK. We want to continue the project around the play for a minimum of another three years though. We'd like to bring people from the Children's Centre, which provided us with rehearsal space, over here. We'd like people to see how we do things at our inclusive drama academies. These [models] can be taken back over to Lesotho and provide a lasting legacy. Learning Disability Today: People with Down Syndrome are under-represented in drama. What needs to change? Jon Daffyd Kid: We were very lucky that we got funding through Wales for Africa. If you look at their portfoilio, there was nothing creative on there. Getting through suggests there is perhaps an appetite for creative aid, not just financial aid. Learning Disability Today: What is the secret to being a good actor? Jon Daffyd Kid: Because there are so many different styles of performance, it’s quite difficult to quantify. We have some very proficient physical performers. In our last performance, Meet Fred, we had some very strong verbal performers. Passion and desire are important. Learning Disability Today: What is the best way of supporting someone with a learning disability who wants to act? Jon Daffyd Kid: Exposure and opportunity are massive. If you were to go through university or drama school the chances of being accepted are minimal. That's sadly what we've seen. We’re creating opportunities through employment. All of our academies are for people 18 and over, but we’re in the process of setting up academies for under 18s. Join the Learning Disability Today Study Day - it's never too late to learn inclusive, accessible communication. Learning Disability Today: How difficult is to make a living out of acting and to what extent do HighJinx rely on demand from the public and support from grant providers? Jon Daffyd Kid: Like everyone else, we’re looking at how we can make ourselves less reliant on funding. With Meet Fred, our lead actor was in a difficult position as the work pushed him over the threshold of being able to access benefits. That then means you need to wait three months before being able to access benefits again and the independence that can bring. In an ideal environment there would be no need for a company like ours. Learning Disability Today: People with Down's Syndrome receive more media interest on awareness days. What would you like this year's campaign to do or to change? Jon Daffyd Kid: Be open. Our actors are funny, creative... humans. Have conversations. It might be a different conversation, but it will be the best conversation you have that day. It’s a fun conversation. People with learning disabilities want to learn; want to absorb information. Embrace that.